I'm celebrating the Fourth of July with James Cagney's performance of That Yankee Doodle Boy in Yankee Doodle Dandy (1942). The story behind the song is below. That Yankee Doodle Boy is one of old Hollywood's most familiar patriotic songs thanks to James Cagney's electrifying performance as Broadway showman George M. Cohan in Warner Bros. 1942 musical Yankee Doodle Dandy. Cagney actually performs the number twice in Yankee Doodle Dandy. First, he plays the song on the piano to convince a befuddled theatrical producer (S.Z. Sakall) to back his show (clip below). The second version of That Yankee Doodle Boy (clip at the top of the page) recreates Cohan's energetic performance in the 1904 musical Little Johnny Jones, a smash-hit that included another of Cohan's best-known tunes, "Give My Regards to Broadway." There are elements of Cohan's own life in Little Johnny Jones -- fun fact: Cohan was actually born on July 3 -- but it is mostly based on the famous American jockey Tod Sloan, who became a media sensation when King Edward VII hired him to ride his horses during the 1901 racing season. Sloan was actually quite a colorful character who became one of the first mass-media celebrities. He was a staple of the tabloids for his risque social life, and he appeared on vaudeville and in silent films after he retired from racing. 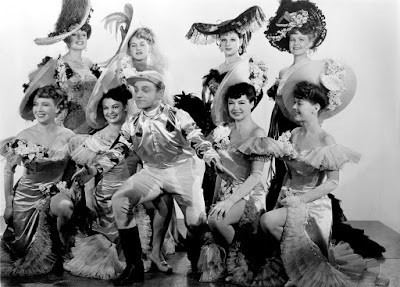 James Cagney and a bevy of showgirls in Yankee Doodle Dandy (1942). That Yankee Doodle Boy is a bouncy number performed in Cohan's signature fast-talking style. The song includes snippets from "The Star-Spangled Banner" and the popular folk tune "The Girl I Left Behind Me" (you've heard that one if you've seen any of the John Ford/John Wayne cavalry pictures), but the lyrics also included a lot of contemporary slang. The first line, "I'm the kid that's all the candy," is 1900s parlance for someone who is popular with the ladies. Cohan's flag-waving songs had a revival of popularity after the U.S. entered World War II in December 1941. Here's Mickey Rooney and Judy Garland performing That Yankee Doodle Boy in Babes on Broadway (1941). That Yankee Doodle Boy has continued to be part of America's consciousness thanks to Cagney's unforgettable performance in Yankee Doodle Dandy. There's even a Disco version of That Yankee Doodle Boy recorded in 1977 by Paul Jabara, who is best-known today for writing Donna Summer's Last Dance. Here's his version to get your Independence Day weekend off to a groovy start.